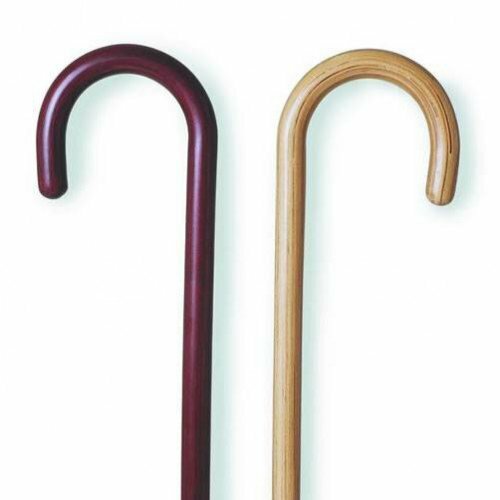 Tourist Cane from Mountain Properties is a traditional, solid wood walking cane, also known as a Hospital Cane. This Walking Cane can be used in either the right or the left hand. The Tourist Cane is available in four different finishes. Mountain Properties Tourist Cane Product Numbers: 03001, 03002, 03003, 03004. Height: approximately 36" - 37"
Color Options: Rosewood, Walnut, Natural, Ebony. Replacement Rubber Tip Size: 18 mm. What type of wood are these canes made from? I weight about 225 and have Post Polio Syndrome (PPS). I prefer two canes (instead of a walker) for support. The canes I received were an excellent value for the money and a little larger in diameter than the advertised 18mm, which is very beneficial for my size, weight and use. Easier to grip, very solid and nicely finished at a very reasonable price. Just what I wanted....came on time. By no means are these the fancy canes of other websites, but for what they are, these are nice canes. Exactly what I wanted, a fair price, and arrived much sooner than expected. Can't ask for more than that. GREAT value and comfort for your money! I like this simple wooden cane so much that I bought one in every color! They are far more comfortable for me that the offset metal canes. I have MS, and really need a cane for support and comfort. These you can hang over your arm to use your hands, and they don't fall on the floor. So far, these are the best canes I've ever had. I love them! Fast shipping, too!